A wonderful collectible from the Victorian era, circa 1880. This grape storage bottle is embossed on the top surface of the bottle with "Copped Hall Grape Storage Bottle patent applied for No 25693" and "W.Wood and Son Ltd Wood Green". 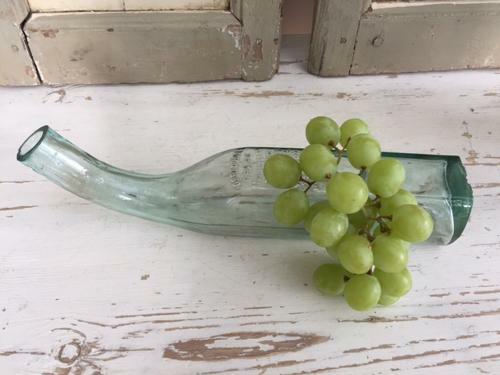 These were filled with charcoal and water and then bunches of grapes would be cut and stored in the stem of the front upturned neck of the bottle. In great antique condition, lots of 'bubbles' in the green glass and a few minor nicks to the openings. Not easy to find these days.